Its revolutionary formula is enriched with an unprecedented ingredient: Pistacia Resin Oil, from the Chios Island in Greece. Approved by 100% of the volunteers*, this concentrate of powerful marine ingredients is effective against all signs of aging. Skin is regenerated, facial features are visibly tightened and your complexion is fresh and luminous. Melting and delicately perfumed, Night Renewal Cream brings comfort and nutrition throughout the night. *Satisfaction evaluated on 24 women of 45 to 65 years-old, after twice-daily application during 28 days. 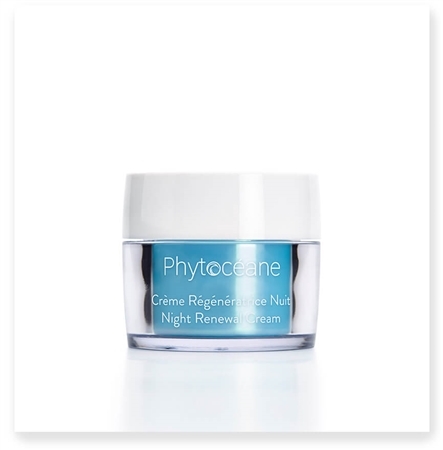 Approved by 100% of the volunteers*, this concentrate of powerful marine ingredients is effective against all signs of aging. Your skin is regenerated, your facial features are visibly tightened and your complexion is fresh and luminous.